IntranetPro provides every user with their own personalized homepage which displays content according to their needs and interests. Relevant information can be accessed through quick links and bookmarks, and daily weather forecasts and birthdays are displayed. Members can also follow specific communities or departments to track their activity. Liking, commenting, and sharing lets users interact with content including events, photos, videos, articles and updates. For quantitative engagement data analysis, IntranetPro records all views, shares, likes, and comments on each piece of content. Engagement is calculated automatically, and users can compare data across different time frames through the easy-to-read dashboard. Users can also identify trends in engaging content and use this data to inform their content strategy. IntranetPro’s inline editor enables quick creation of articles, which can be published instantly or scheduled for later. The search of business intranet systems can be a task crammed with failures, either due to its difficulty of access or also because of the difficult task of adapting to new intranet bases, but with IntranetPro you can end up once and for all those deficient searches that so afflict your company. I am a designer employed in a company with a lot of competition at the commercial level, we worked at the wrong time and even it was difficult for us to deliver projects in the agreed times, but when changing the Intranet and starting to use the IntranetPro system those delays disappeared, it transforms those obsolete custom models of SharePoint, in order to shorten time in the administration of content and / or processing. Contact Codesigned for a quote. • The inline editor allows users to author, edit, and publish intranet content with a real-time view of what they will look like once live, and photos, videos, and documents can be uploaded and stored. • All engagement data is gathered in a single location, and users can compare employee engagement across different timeframes to gauge their progress. • Users can follow communities and departments to stay updated on their activities, and view relevant content through the personalized feeds on their homepage. • IntranetPro allows users to distribute emergency alerts to employees for important information, and broadcast announcements for brief updates. Below are some frequently asked questions for IntranetPro. Q. What type of pricing plans does IntranetPro offer? Q. Who are the typical users of IntranetPro? Q. What languages does IntranetPro support? Q. Does IntranetPro support mobile devices? Q. Does IntranetPro offer an API? No, IntranetPro does not have an API available. Q. 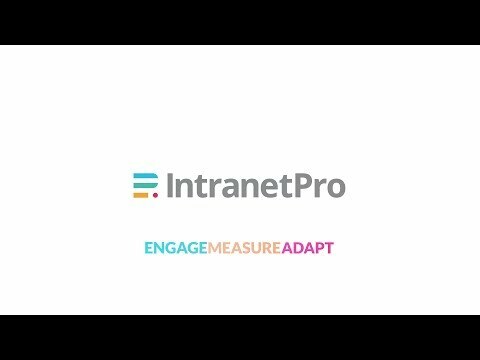 What other apps does IntranetPro integrate with? Q. What level of support does IntranetPro offer?